© 2010 Southeast Custom Carts Inc. All rights reserved. Southeast Custom Carts starts with quality, taking to heart the needs of the customer first. Southeast Custom Carts has built its reputation on being the very best in the industry with the heart of a family owned business. That reputation continues today, and will carry on far into the future. The customers of Southeast Custom Carts know that excellence is in the very foundation of the business. If you, the valued customer aren’t getting the highest level of service to meet your needs, contact us using the form on the Contact page. Call (561) 386-1888 today to set up an appointment. You can turn a golf cart into a Street Legal Ready Cart with a few modifications. 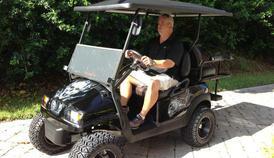 A Golf course cart can be equipped to also carry 4 passengers or cargo when not out on the course. Limo (6 seats) also available. 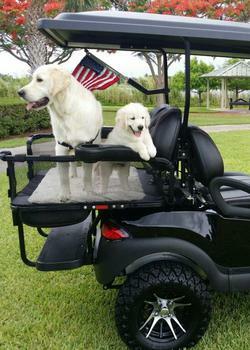 Not all Golf Carts are created equal. It's not just what's on a cart, but what's under and in the cart that will withstand the test of time. John and Sherry, the cart is awesome! We are thrilled! Thank you for the outstanding service and buying experience.